For my final project like Aneta and Stephanie am going to continue with XML coding. I am looking at a Japanese card game called Karuta. The game contains 2 decks of cards: one for reading, and one for collecting. The cards contain 100 poems that are memorized by the participants. Collecting Card on Left. Reading Card on the Right. The collecting deck is laid out in front of the participants and another person reads out key phrases from the poems. Those collecting try to locate the corresponding card as quickly as possible usually by swiping it out of the deck. 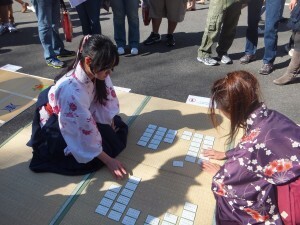 In Japan there is even a competitive league for Karuta. My final project will consist of XML coding one of the children’s games that teaches the basics of the Japanese alphabet, Hiragana. 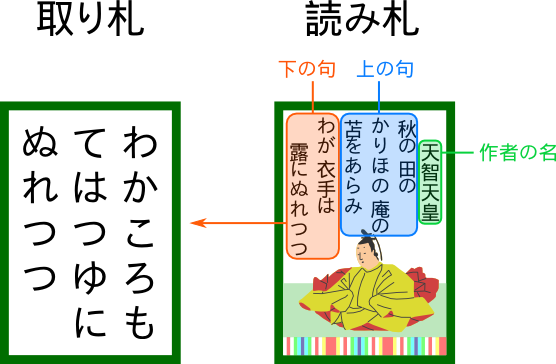 I would like to look at the complexities of trying to code a physical card game from another language using XML and a short paper on some issues with digitization. With the rush of attempting to digitize materials, we forget that books are not the only forms of knowledge. I will examine how non-linear narratives are encoded when using TEI Guidelines and whether this is suited for this task. In addition, I will discuss what is lost in the process of digitization. For example, the socialization aspect of the game is lost if you digitize it and make a game interface where there is little to no interaction. What do you guys think about this? Any suggestions on directions I can go or that I haven’t thought of? If this topic does not work out, my backup plan is to do a paper on the future of creativity and innovation in a world where we have increasingly stricter copyright laws and digital rights management.